We have a fantastic relationship with West Town Lane Academy and have developed their playground over numerous phases that have given their children opportunities for active and imaginative play. After a further discussion with the headteacher, Jeremy Hughes, he now wanted to take his student's scientific thinking outside of the classroom and offer them an area for investigative learning. 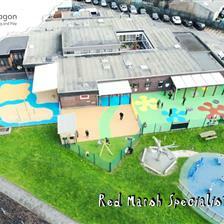 He wanted his playground to offer an exclusive area for children to carry out real-life experiments and get them enthused about scientific topics. 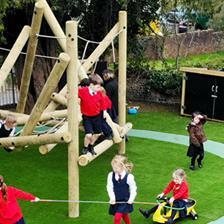 The playground didn't offer the children opportunities for natural learning and Jeremy wanted to introduce this exciting element to the schools learning environment. Science truly comes to life in an outdoor environment and with children's unbounded love and curiosity for nature, we decided that our Wildlife Area would be the ideal playground addition. We like to call our Wildlife Areas - 'Secret Agents Outdoor Labs' as they offer children a learning zone to carry out practical experiments and further investigate the natural world. The Wildlife Area includes a pond which creates a compatible environment for aquatic insects, fish and water based plants for investigation. It also includes a planting area for the growing of vegetables and wild flowers so that children can better understand the environmental needs for each of these to thrive and grow. There is also a storage unit where children can store resources and a 'minibeast' factsheet which children use to identify the different minibeasts and pond animals that the area attracts. A month after installation, we came back to visit the academy to donate oxygenated plants and fish. Before releasing the fish into the pond, we had an outdoor class discussion about the importance of pH levels and temperature regulation for the fish before they entered the water. Each fish had its own distinct colour so that children were able to give them their own special name. It was a fantastic visit and it really opened our eyes to the many benefits our Wildlife Area can bring. One real eye opener was the in depth class discussion on the ecosystem that, with the topic covered, gave the children some great preparation for secondary school as they'll be covering the exact same topics once they begin their next educational venture. 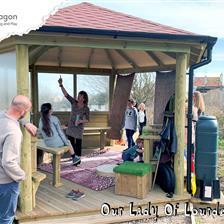 "The children love it and we've even set up a gardening club tasked with developing the area further and maintaining it. We'd like to thank Pentagon for installing this fantastic addition to our playground and for providing oxygenated plants and fish for the pond. The next steps for the gardening club, is to plant vegetables in one corner and a 'minibeast' hotel in the other". If you'd also like to bring your science lessons to life, take a closer look at our Nature and Planting section to see how we can help develop your school's outdoor learning. Our Wildlife Area designs can also be bespoken to suit any particular need you may want, contact us through the website to find out more.